Starfish represent some of the real works of art that come forth from the depths of the world's oceans, and for the lovers of the seas, these creatures offer viable options for wall decor. If you've collected some real starfish that you want to hang on your walls, there are several methods you can use to do this task. Depending upon your decorating goals, you can create some traditional art media using starfish as well as some works that are decidedly more decorative in scope. Sketch out your ideas on paper to work out placement and composition issues that you may encounter before you start gluing your starfish on the canvas. It'll also help you determine how much of the visual information you'll paint on. Get an artist's canvas. Look for a large canvas — at least 18-by-24 inches — if you'd like to re-create a large, bottom-of-the-ocean piece. Or buy several small ones to create a series of starfish portraits. Paint the background of your starfish painting. Include visual elements such as the yellow sand and currents of blue water. Oil or acrylic paints will work best for this. Allow the piece to dry according to the instructions on the paint tubes. Glue the starfish onto the canvas using a hot glue gun, and allow the glue to cool. Frame the starfish canvases and hang them up. Go to the craft store and buy shadowbox kits. Make sure that the kits you purchase have compartments that are big enough to fit your starfish. Collect materials such as postcards of the beach, pieces of fishing net that you found washed up on shore, vials of sand from your favorite beaches or family photos of you at the beach collecting starfish. Remove the protective glass from the shadowbox. Place items such as the postcards, photos or the fishing net inside so that they lean against the back wall of the shadowbox. Glue them in with a bit of craft glue. These provide a backdrop for the starfish. Position the starfish in front of these items, and place smaller items at the feet of the starfish. Replace the protective glass and hang on the wall. Select some mirrors that have wide, wooden frames around them. 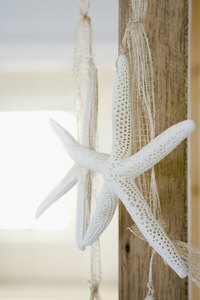 Use a hot glue gun to glue real starfish of various sizes around the frame of the mirror. Glue the largest ones in the corners and then decorate the remainder of the frame with small starfish. Add a few starfish to the mirror itself. Stick the areas closest to the edge and the corners. Allow the glue to dry. Hang the mirrors up in a decorative gallery or above your bathroom sink if you've chosen a nautical theme for the room.